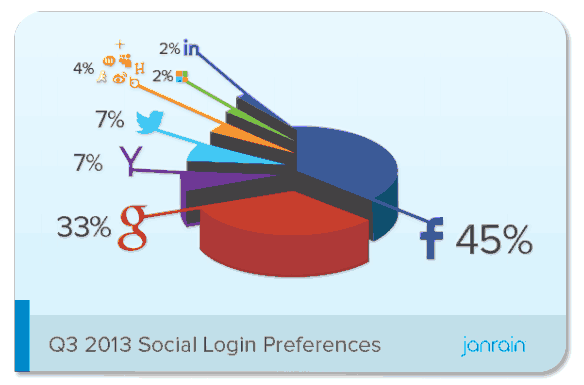 Janrain, the popular user-management and social login provider, announced its latest social login trends report today. It looks like Google’s recent advances in getting people to use its social login solutions have hit a plateau. After a year of sustained growth that allowed it to go from 25 percent of social logins across Janrain’s vast network of partners to 34.4 percent last quarter, Google’s numbers actually dropped to 32.9 percent in the third quarter of 2013. Given that Janrain added the new Google+ Sign-In tools in April, it’s a surprise to see that the company didn’t register a growth in Google sign-in usage over the last quarter. Google itself has been very upbeat about the performance of Google+ sign-ins, and most of the early data I’ve seen supports this sentiment. Maybe the slew of NSA revelations that implicated Google drove people away from using it, or maybe Janrain’s partners made some changes that explain this shift, but it’s definitely odd. We will have to watch the next report to draw any definitive conclusions. Facebook, it’s worth noting, also dropped more than 1 percent in Janrain’s charts. However, it’s still comfortably in the lead at 44.9 percent, compared to 46.2 percent last quarter. Facebook’s lead, by the way, is especially obvious when looking at some of Janrain’s user segments. It dominates sign-ins on media and retail and gaming sites, for example, where it owns between 53 percent and 62 percent of logins. Google barely gets above 20 percent in these categories. On B2B sites, on the other hand, Google keeps closing the gap and is now at 26 percent compared to Facebook’s 33 percent. The users Facebook and Google lost seem to have moved to smaller players in the social log-in game. Yahoo and Twitter registered some growth last quarter, for example, and now power 7.1 percent and 6.5 percent of Janrain’s logins.